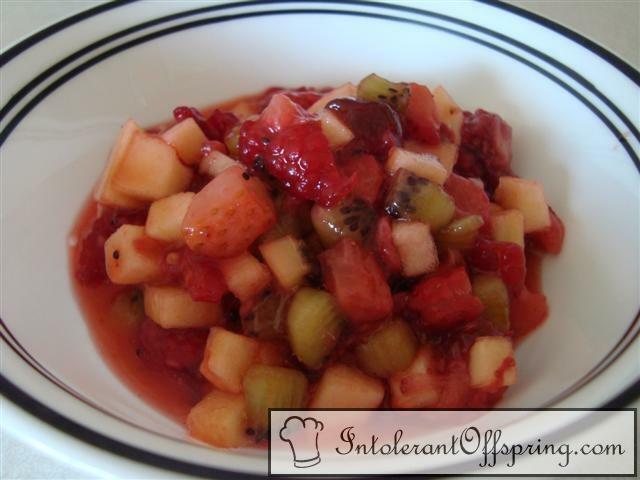 To make fruit salsa: Mix kiwis, apples, raspberries, strawberries, sugars, and preserves. Cover and chill at least 15 minutes. To make tortillas: Preheat oven to 350. Coat both sides of each tortilla with cooking spray. Sprinkle one side heavily with cinnamon sugar. Cut into wedges with pizza cutter and arrange in single layer on a large baking sheet. Bake in oven for 8-10 minutes. Allow to cool completely.